We enjoy a bit of friendly competition every now and then, so when our 2018 Fall semester students participated in our first-ever virtual, live debate tournament between IES Abroad Centers, we were very excited! From November 19-23, matches took place online between students from our Barcelona, London, Siena, Madrid, and Milan Centers. The teams consisted of two students each, who volunteered to be part of the competition. Matches, judges (staff from IES Abroad Centers), and topics were picked randomly. 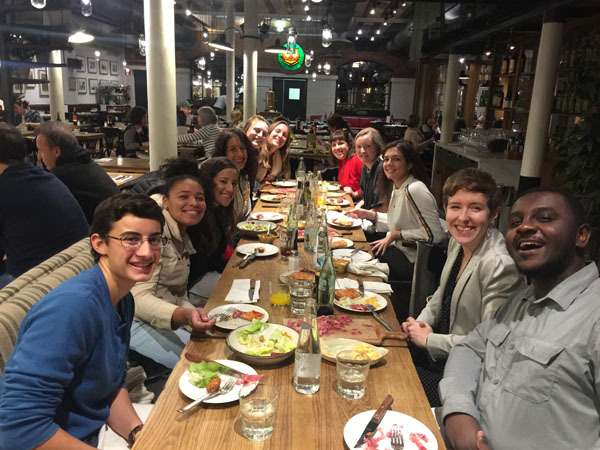 IES Abroad flew the top four performing teams to Barcelona for the Final Four Tournament, held at the IES Abroad Barcelona Center at the end of November. After the students toured the Center, got set up in their hotels, and received gift bags with bus tickets to explore the town, the teams and judges gathered for a friendly lunch before the competition commenced. The judges were Sally Harrild from IES Abroad London, Vittoria Moggi from IES Abroad Siena, Maria Leal from IES Abroad Barcelona, and Cesar Alegre Alsina from IES Abroad Barcelona. Topics—which included artificial intelligence, European migration concerns, and whether Catalonia should be independent or not—were proposed to the students by Center Directors that included a short bibliography as a reference tool (although all teams developed their sources on their own). Student participants had to develop sources on both sides of the topics so they could argue either side, the proponent and opponent roles being assigned prior to the debate (by lottery) to allow for more fine-tuned preparation. The competition was composed of three matches, in which each finalist had a chance to compete against the others on three pre-selected topics. Before each match, a coin was flipped to determine which team would go first. The judges were very impressed by the level of preparation of each of the teams, as well as the ability to brandish arguments with both logic and empathy. All teams won at least one match out of three, and two teams won two matches (Paris 1 and Siena 1). The winner? After a very close competition, Siena 1 took home the victory with the most points scored. Both students and judges pointed out what a great experience it was to participate in the tournament. 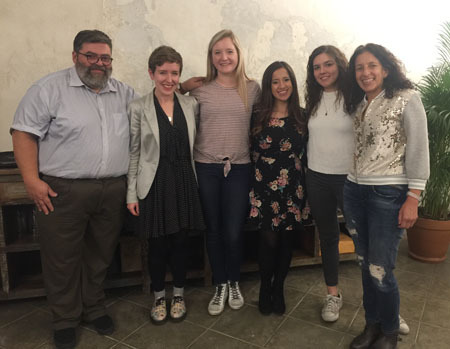 Along with the free airfare and accommodation in Barcelona, students also enjoyed preparing for the debates, which helped them develop critical thinking abilities. IES Abroad’s programs offer many hands-on, interactive cultural activities, course-related trips, and more. Explore our 140 study abroad and internship programs by using our Program Finder. Meet Jay Lauf (IES Abroad Durham 1984-85 | Connecticut College), co-CEO of Quartz, a global digital news site with more than 100 journalists on five continents. Read on as Jay shares his professional journey in journalism, the inspiration behind Quartz, and how lessons learned abroad have impacted him every step of the way. Once a year, nearly 200 international education professionals head to Capitol Hill for NAFSA’s Advocacy Day, where they’re given the chance to educate Congress on the value of international education and the need for a more globally engaged and welcoming United States. The adjustment period students go through when studying abroad can be challenging, but our student Correspondents know how to navigate it. Whether you live in a skyscraper in Shanghai or snorkel with sea turtles in the Galápagos Islands, studying abroad has the power to change the way you see the world – in little and big ways.